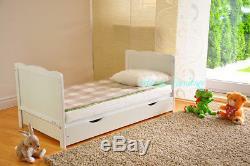 NEW WHITE SOLID WOOD BABY COT BED - JUNIOR BED with Drawer. Includes Deluxe Mattress Aloe Vera conforms to safety standards in the UK. The mattress has the bsi label BS 1877-10:1997. Every wood product that we sell is manufactured in Europe & complies fully to every required standard for sale in the UK. 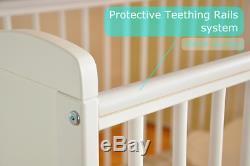 Cot bed Made in Europe from Natural Wood to British Standards. 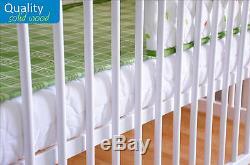 Cot Features: cot dimensions: 124cm x 67cm x 85cm. 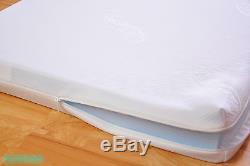 Includes Drawer Deluxe Mattress includes 8cm Foam Aloe Vera Mattress includes water repellent. Mattress liner colour WHITE solid wood 3-position base (height adjustable that can match your baby growth) Deluxe Mattress Features. Mattress conforms to safety standards. BS 7177: 2008 + A1: 2011. BS 5852: Part 2: 1982. 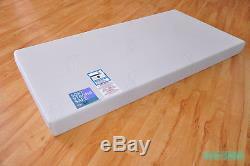 Mattress dimensions: 120cm x 60cm 8cm high density CMHR25 foam mattress Un-zipped removable and washable cover. Varnishes in accordance with the latest standard. Execution in accordance with the latest standard. COT-BED BEDDING FOR DISPLAY PURPOSE ONLY (NOT INCLUDED). The item "Baby Cot Bed with Drawer White Junior Toddler Bed Deluxe Aloe Vera Mattress" is in sale since Tuesday, June 17, 2014. 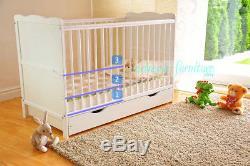 This item is in the category "Baby\Nursery Decoration & Furniture\Cotbeds". The seller is "extreme-furniture" and is located in Coventry. 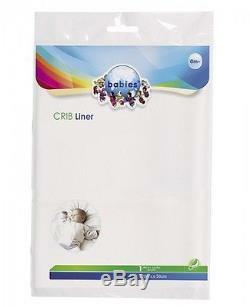 This item can be shipped to United Kingdom, Ireland, Germany, France, Greece, Italy, Spain.